Genoa, Illinois, native Steve Karmgard received his brand new Toyota Sienna yesterday asone ofthe2016 NMEDA Local Heroes Contest winners. "I knew about the contest a few years ago because my mother-in-law worked with somebody who had won," Steve explained. "I'll be honest, I forgot about it, but my driving therapist reminded me when I went in for a re-evaluation." Steve needed to get into a new vehicle and started to research what would be right for him. He owned a van with a lift, but as the vehicle was reaching 15 years old, the well-loved van was tired. "Basically my van was held together with bungee cords and zip ties in many areas." His entry video for the contest shows his service dog, Pluto, pulling a rope to extend the lift which appears to be jammed. Still, Steve said, the ramp and vehicle are responsible for his engagement, marriage, owning his own home and his stable career at ADP. "I was able to progress my life...well, more like everyone else." A leader in his workplace and a diligent volunteer for Canine Companions for Independence-the same service dog training organization that matched Pluto with Steve-Steve was clearly a hero to his local community and garneredbetween 22,000 and 23,000 votes to get his story before the committee. 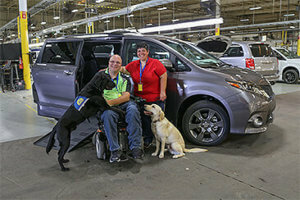 Steve, Helen, Pluto, and Jed, the newest four-legged addition to the Karmgard family, visited BraunAbility headquarters in August to see Steve's van being made. They got the full tour, starting with stage one of taking all the interior components out (think seats and consoles) to the final quality inspection. Then it was off to Mobility Works to fit the vehicle to Steve's needs. BraunAbility makes a vehicle accessiblefor people in wheelchairs, and thenour dealers work with our customers to tailor the vehicle with theproper hand controls and chair restraints for them. 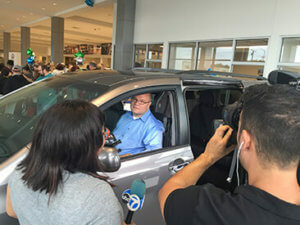 Thursday, the Karmgards and a small army of their friends and family showed up to Schaumburg Toyota in Illinois to witness Steve getting the keys himself. Most of all, Steve is looking forward to a life without car complications. Not having to limit himself because of the age of his van will allow him to spend more time in the office where he excels, and possibly even open up the doors for more travel in the future. 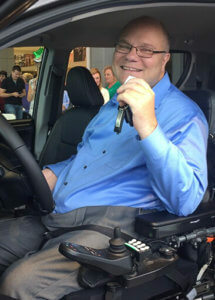 Congratulations, Steve, and we hope your BraunAbility van serves you as well as you continue to serve those around you! Follow Steve and Pluto on Facebook to keep up to date with their volunteering and adventures!